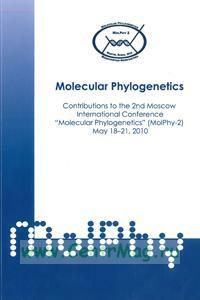 Molecular Phylogenetics (на английском языке) Троицкий А. Knowledge of phylogeny is of fundamental importance in evolutionary studies, fron the reconstruction of the Tree of Life to revealing and understanding the laws of body plan formation (the evo-devo realm), to describing the patterns and processes of microevolution. The discipline of phylogenetics has evolved radically in the capi talizing on theoretical and methodological breakthroughs in analyses and algorithms on the exponential increase in molecular data, and on the availability of vast com puting power to enter the phylogenomic era. A solid methodological framework for phylogenomic analysis is emerging, applying data derived from whole genomes to problems in deep phylogeny, functional genomics, speciation and divergence, am phylogeography. The 2nd Moscow International Conference "Molecular Phyloge-netics" (MolPhy-2) provided a stimulating platform for the exchange of ideas am experiences, cross-disciplinary interactions, and long-term national and international collaborations. Its major focus was to discuss the modern state of molecular phy-logenetics and systematics, the interfaces between molecular and phenosystematics molecular phylogenetics of different organisms, and the development of natural classification systems. The conference was dedicated to the memory of Professor Andrey Antonov, the founder of the Russian molecular phylogenetics school. RAPD-PCR analysis of mutant lines Arabidopsis Thaliana (L.) HEYNH. Detection of insertion sequences in mtDNA: What transmission routs are probable in fish and birds, gender, horizontal or both? Evolution of Lake Baikal coregonine fishes: Is it an example of periodic intra-lacustrine adaptive diversification?